With more and more customers buying online these days, it’s important that your online presence supports your brand’s image. You want consumers, employees, and competitors to all have the same image of your brand in order for it to be successful. One of the most important platforms for communication is your company blog, and it is especially key when building a cohesive brand identity. In order to be consistent, pay attention to these six important factors when building your blog. A laid-back template gives the impression that your product is casual and fun. If you have a more serious brand, opt for a more polished template. The aesthetics of your writing influence consumers’ perception of your brand as well. Writing a word or two in ALL CAPS can create a feeling of excitement. People tend to be visual, so a picture will sometimes pull a customer in even faster than the title of an article. High-quality pictures tell customers that your company is professional and that you have a high-quality product. Your blog is an opportunity to create relationships with customers, not to bombard them with sales pitches. Providing fresh, original content that your readers won’t find elsewhere will keep them coming back for the information they need. And avoiding re-spun content shows that you value quality and innovation. Most blog articles should be between 600 and 800 words, though it’s good to have variety in the length and type of your articles. Make posts professional and relevant to your customers, while keeping them personal. An edited, grammatically correct blog shows attention to detail and an effort to provide quality information to your readers. Readers want quick, easy-to-digest information, but they still want to read well-crafted writing. Show them that your blog has both; give them a reason to trust what you say in your posts by backing it up with sound information and tailored sentences. Almost as untrustworthy as a sloppy blogger is an inconsistent blogger. Blogs should be updated regularly to keep readers interested and to cultivate loyal, consistent readership. Stopping your blog without warning or taking long breaks from blogging will cause you to lose your readers’ trust and interest. Updating your blog shows that you care about your readers and that you are invested in what you are writing about. Providing a place for comments shows that you value what your readers have to say. Responding to comments and questions will help you build a relationship with customers. Always end your posts with a call to action or a question to keep a conversation going. And what about others’ blogs? 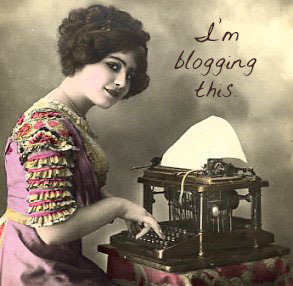 Commenting on other blogs will actually drive traffic to your own blog. Joining other blog conversations shows attentiveness, a desire to engage in conversations, and openness to ideas. Make sure your comments are tasteful and professional. Everything you say is a reflection of your brand. Catchy titles not only show that you are witty—and you are very witty—they also demonstrate your awareness of the blogging market. There are 416 million people viewing blogs and about 35.8 million new posts published each month. You’ve got to keep up and stand out! So use lists like “The 5 Best Christmas Costumes for your Feline Friend” and intriguing phrases such as “Why You Might Get Arrested this Week.” Your titles should snag a reader’s attention and make them want to keep reading. As you define your brand, remember that your blog will be crucial in supporting the image you are trying to create. Your brand image determines customers’ trust in you. Review your blog, and be sure that everything on it reflects the desired image for your brand. Originally from Calgary, Theo Schmidt moved to the United States in 2002 to pursue his undergraduate career. He currently works as a software engineer for a company in Los Angeles and is an environmental activist. He also does some consulting for Clickcom, an SEO company in Charlotte, North Carolina. Absolutely right! I am also a blogger and I can say that I am also using this method for creating my blogs, that if they can see the title they can say “this blog looks interesting”. Yes of course the content should be interesting and they can learn lessons about it, sometimes persons who read your blog will be back for more updates about you and your blogs in the future.